I am pleased to announce that the second edition of Litigating Religious Land Uses Cases has been published by the American Bar Association. It is available through the online ABA bookstore. Why a book about religious land use? My goal for this book is to provide religious entities and the lawyers who represent them with practical advice from my personal litigation experiences with RLUIPA, the Religious Land Use and Institutionalized Persons Act. It is my hope that the book will serve as a useful guide for navigating the challenges and uncertainties that inevitably surround a religious land use claim. I have represented religious institutions throughout the United States: from a Catholic high school in California to a Hindu temple in Pennsylvania. 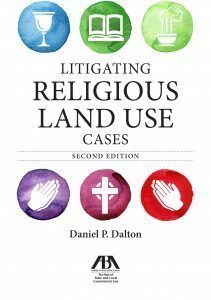 This book is intended to afford sound instruction based on some of those matters, as well as other reported religious land use cases that have been litigated throughout the United States and the courts’ interpretation of the statutory protections offered to religious entities in an attempt to level the playing field. Soon after the first book was published in July 2014, readers contacted me and asked that when I write the second edition, I add in several new items. In addition, courts have made several significant RLUIPA decisions. It wasn’t difficult to realize a new edition could be significantly better if I added in the new cases and addressed the recommendations from my land use attorney colleagues, clients and friends. This new edition updates all of the new case law involving RLUIPA through March 1, 2016. I have updated and enlarged the chapters addressing similar additional claims that can be raised in the context of religious land use and have added more historical context of the statute and related First Amendment Free Exercise claims. In addition, appendices were added to include three very important sections. Appendix 3 lists the leading law review articles covering RLUIPA. 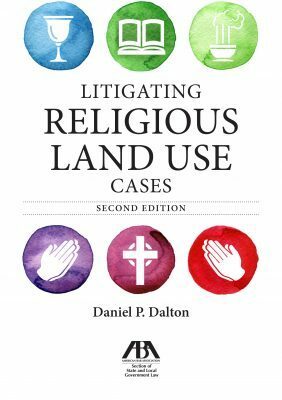 Litigating Religious Land Use Cases is scheduled to be available on Amazon in 2017. I hope you find the book to be a valuable resource. Should you have questions about it or about a land use matter affecting your religious institution, feel free to contact me at ddalton@daltontomich.com or 313-859-6000. Sign up to receive RLUIPA and other religious land use updates from Dan.